St. Paul Mercantile Reopening October 2014 ! As you may already know, a fire destroyed our business in January 2014. We have decided to reopen this month. We have a few products in stock now and our big shipments of kerosene products and water filters will arrive late October. We hope to be fully operational by October 31. We will be releasing a brand new website design any day now. It will support user accounts, will have a much improved shopping cart, and will interface with Twitter and Facebook. Many thanks to so many customers who have emailed us with words of encouragement. For information about the Butterfly brand kerosene stoves, Miles Stair has written many reviews and operating instructions. Miles uses Butterfly kerosene stoves daily in his home and is a world expert on wicks for kerosene lamps, heaters and stoves. If you want to read about kerosene stoves and the #2421 camping oven, a good place to start is our new website, www.kerostove.com Why a new website? Because we are trying some radio advertising, and stpaulmercantile just isn't conducive to radio advertising. "So Check Out These Stoves at www.stpaulmercantile.com - that's s-t-p-a-u-l-m-e-r-c-a-n-t-i-l-e dot com!" Try remembering that after your drive home from work. So, I came up with KeroStove.com. That's K-E-R-O Stove dot com. Simple to remember. 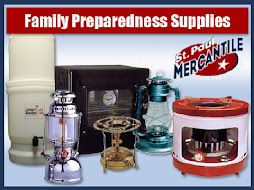 Any clicks on the website will redirect you to stpaulmercantile.com for actual purchases, but www.kerostove.com is a one-page website that allows you to quickly compare a various kerosene stoves, prices, sizes, etc. On 11/30/09, I launched a new website called KeroStove.com that has all of my kerosene stoves, oven, lanterns, and family emergency kits. This website has two purposes. First, I am doing some radio advertising, so I needed an easy-to-remember website name. KeroStove (that's K-E-R-O Stove dot com) seemed to fit the bill. Second, the website is a one-page overview of my kerosene products. So rather than sifting through multiple pages at StPaulMercantile, you can see and compare all the products on one page. When you click on an item, it will take you to the same item on StPaulMercantile, where you can get additional information and buy the item. The Butterfly brand #2421 Oven allows you to bake bread, casseroles, etc. using any kerosene stove. The oven is approximately a 14" cube. It is very sturdy and does not fold up. Inside dimensions are 10" high, 11" deep and 12" wide. The door opening is smaller, so for pan sizing, the door opening is 11" wide and 9" high. It will accomodate a 10x10 pan, which will allow a little air space around the sides for more even baking. The oven will work on any kerosene stove, though it does work better on stoves specifically designed to accomodate the oven. The bottom of the oven has a large square opening. Many of the Butterfly brand stoves have a cooking grate that fits inside the oven's bottom and holds it firmly in place. Stoves that do not have this style grate will still work with the oven, but the oven may not be steady. Many people build an oven frame that holds the oven slightly higher than the stove, so the stove is not actually supporting the oven. You can also use large blocks (cinder blocks, for example) to hold the oven. The Butterfly brand kerosene stoves that work best with the #2421 Oven are: 2413 single burner, 2418 double burner, 2419 double burner with legs, 2415 triple burner, 2417 triple burner with legs, 2648 double-burner 10-wick and 2487 16-wick. The oven works fairly well on the 2698 22-wick stove. While the 2698 does not have the special grate that holds the oven in place, it has a very large cooking surface that makes the oven steady. Which stove is the best to use with the oven? Probably the #2487 16-wick. It does have the special grate, plus it has a higher heat output than most of the other stoves, which makes it possible to attain higher cooking temperatures in the oven. Kerosene Stoves - Which One to Buy? I sell the Butterfly brand of kerosene cook stoves. They are made in Indonesia. 3 Types - You should first be aware that there are 3 types of stoves. 1) Brass Pressurized stoves (#2412), 2) Gravity fed wick stoves with fuel bottles (2413, 2418, 2419, 2415, 2417) that come in single, double and triple-burner models, and 3) Multi-Wick stoves that have 10-22 cotton wicks arranged in a circle. These wicks can be moved up and down to adjust the heat output of the stoves. Brass Pressure Stove - Pressure stoves are in a category all their own. They do not have wicks, as they actually boil the fuel and burn the vapor. The burner assembly must be preheated by burning a couple teaspoons of denatured alcohol (available in a quart can at any hardware store). The flame from the alcohol heats the burner assembly for 20-30 seconds. When the alcohol is just about to go out, you start pumping the handle. Liquid kerosene from the tank enters the burner assembly and the first few drops turn to vapor, which is then ignited from the alcohol's flame. Once the flame has started, the heat from the flame keeps the burner assembly hot enough to continue to vaporize the rising liquid kerosene. Pressure stoves are highly efficient, they produce the least fumes of any type of kerosene stove, and they disassemble for carrying in a backpack. Gravity Fed Wick Stoves - these stoves have a fuel bottle with a spring-loaded cap on it. The bottle releases fuel into a fuel reservoir and the fuel then runs through a fuel rail to the burner(s). Each burner contains one woven fiberglass wick that is bent into a circle, about the size of a metal jar lid. The flame burns off the top edge of the wick. Worldwide, these are the most popular stoves sold. Many decades ago, these were sold in the USA by Sears and Montgomery Ward. Each burner has a wire contraption that will keep small pots or skillets in place. It is shaped such that the optional oven will fit perfectly over the wire and will be held in place on top of the stove. Flame height adjustment is done by increasing or decreasing the amount of fuel that gets to the wick. It can take up to a minute for the flame adjustment to occur, as the wick must absorb extra fuel (if increasing the flame) or burn up the excess fuel (if decreasing the flame) before it adjusts to the new level of fuel delivery. Multi Wick Stoves - These use multiple cotton wicks, arranged in a circle. All of the wicks can be moved up or down to increase/decrease the amount of heat from the stove. More wicks means more heat, so the entry level 10-wick stove produces about 7000 btus of heat, while the 22-wick stove produces 14,000 btus. Recommendations - If you need something small and transportable, choose the brass pressure stove. For most people, the #2487 16-wick stove is going to be an excellent choice. It is hot enough to cook meals, it has an improved tank design over the 14-wick 2628, and it has the special wire top that works perfectly with the oven. For canning, the #2698 22-wick stove is the stove to buy. It has the highest heat output, and the largest cooking surface for holding your canner. How can it not be vented? How efficient are they? Are they safe? Which is better, blue-flame or infrared? My name is John Squires, and I am the founder, owner and operator (also warehouse manager, secretary, and janitor) of St. Paul Mercantile. I started the website in 1998 as a hobby, then in 2001 I quit my corporate job and devoted all of my time to the website.